Have you ever been invited to a baby shower and panicked at the thought of giving a gift? There’s no telling what others are bringing, and redundant presents are typically gotten rid of, with the exception of practical presents like diapers, wipes, and cleaning supplies. But who wants to bring a boring gift to a baby shower? We’ve found an original solution, one that will delight the recipient as well as their soon-to-be-born. 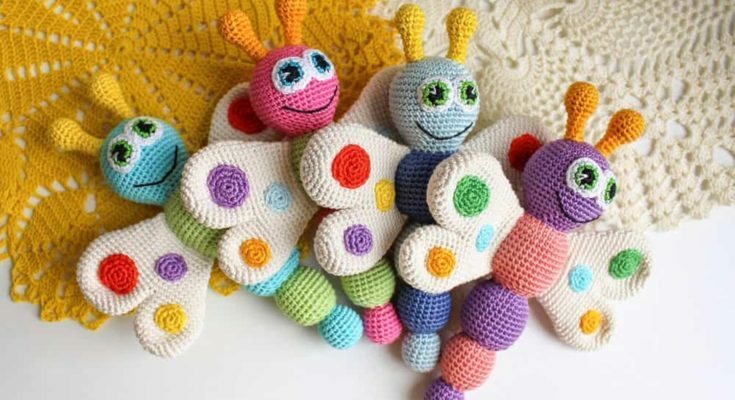 This crocheted butterfly rattle will provide hours of entertainment for baby, and kept for the next generation. Have a baby shower to attend? Give yourself a few days of planning and prep and you can have your own gorgeous little gift for the new baby in your life, whether it’s yours, your sibling’s, or your friend’s or co-worker’s. You can find the list of materials, the stitch guide, and the written tutorial here.